The developing brain prunes (eliminates) unneeded connections between neurons during early childhood. Now researchers from the Salk Institute for Biological Studies and Carnegie Mellon University have determined the rate at which that happens, and the implications of that finding for computational networks. Neurons create networks through a process called pruning. At birth and throughout early childhood, the brain’s neurons make a vast number of connections — many more than the brain actually needs to function. So as the brain matures and learns, it begins to quickly cut away connections that aren’t being used. When the brain reaches adulthood, it has about 50 to 60 percent less synaptic connections than it had at its peak in childhood. Understanding how the network of neurons in the brain organizes to form its adult structure is key to understanding how the brain learns and functions. But the processes the brain and network engineers conventionally use to learn the optimal network structure are very different. Computer science and engineering networks initially contain a small number of connections and then add more connections as needed. The results of these experiments allowed the team to develop an algorithm for designing computational networks based on the brain pruning approach. 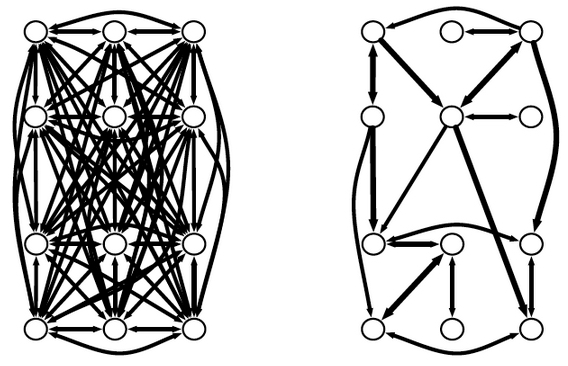 Using simulations and theoretical analysis they found that the neuroscience-based algorithm produced computer networks that were much more efficient than the current engineering methods. The flow of information was more direct, and provided multiple paths for information to reach the same endpoint, minimizing the risk of network failure. 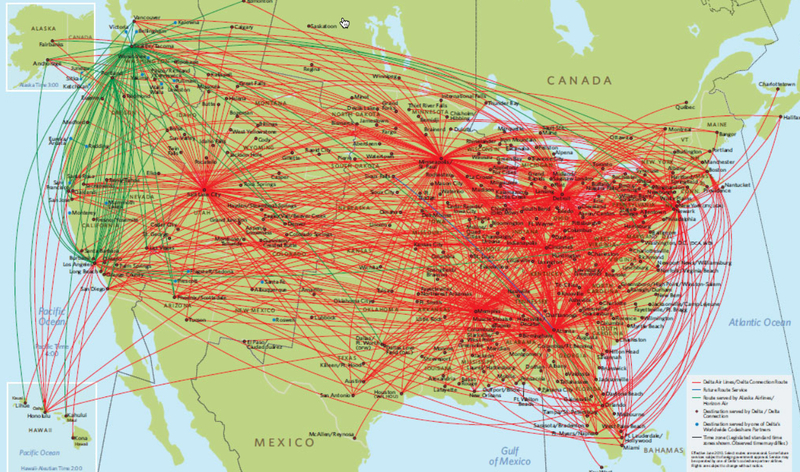 As a test of how the algorithm could be used outside of neuroscience, Navlakha applied the algorithm to flight data from the U.S. Department of Transportation. He found that the synaptic pruning-based algorithm created the most effective routes to allow passengers to reach their destinations. Robust, efficient, and low-cost networks are advantageous in both biological and engineered systems. During neural network development in the brain, synapses are massively over-produced and then pruned-back over time. This strategy is not commonly used when designing engineered networks, since adding connections that will soon be removed is considered wasteful. Here, we use this process as inspiration for a new network design algorithm, which also led to a new experimental hypothesis. In particular, we show that for large distributed routing networks, network function is markedly enhanced by hyper-connectivity followed by aggressive pruning and that the global rate of pruning, a developmental parameter not previously studied by experimentalists, plays a critical role in optimizing network structure. We first used high-throughput image analysis techniques to quantify the rate of pruning in the mammalian neocortex across a broad developmental time window and found that the rate is decreasing over time. Based on these results, we analyzed a model of computational routing networks and show using both theoretical analysis and simulations that decreasing rates lead to more robust and efficient networks compared to other rates. We also present an application of this strategy to improve the distributed design of airline networks. This inspiration from neural network formation suggests effective ways to design distributed networks across several domains.